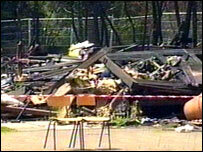 Children are taking lessons on playing fields after a suspected arson attack destroyed their classrooms. Fire fighters were called to the Waldorf School of South West London in Tooting at 1500 BST on Saturday. It it thought the fire was started deliberately at two points beneath the classrooms, in portable buildings. Teacher Michael Williams said:"At first it was a real shock, but now all our efforts will go into trying to rebuild the school. About 100 children have been affected and are taking lessons outside. Term ends in three weeks and parents and staff at the private school have already begun raising funds and planning how to rebuild in time for the September term. Parent Julie Leigh told BBC London: "It's very upsetting, we are all very sad but we are trying to remain positive. "We are trying our hardest to make things as normal as possible for the children." Police are investigating whether the fire was started deliberately.